This article is about full size villages, typically built for factory workers. For miniature model villages, see miniature park. For the place in Ireland, see Model Village, County Cork. A model village is a type of mostly self-contained community, built from the late 18th century onwards by landowners and industrialists to house their workers. Although the villages are located close to the workplace, they are generally physically separated from them and often consist of relatively high quality housing, with integrated community amenities and attractive physical environments. "Model" is used in the sense of an ideal to which other developments could aspire. 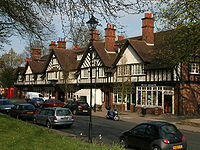 An example of houses at Port Sunlight. The term model village was first used by the Victorians to describe the new settlements created on the rural estates of the landed gentry in the eighteenth century. As landowners sought to improve their estates for aesthetic reasons, new landscapes were created and the cottages of the poor were demolished and rebuilt out of sight of their country house vistas. New villages were created at Nuneham Courtenay when the village was rebuilt as plain brick dwellings either side of the main road, at Milton Abbas the village was moved and rebuilt in a rustic style and Blaise Hamlet in Bristol had individually designed buildings, some with thatched roofs. The Swing Riots of 1830 highlighted poor housing in the countryside, ill health and immorality and landowners had a responsibility to provide cottages with basic sanitation. The best landlords provided accommodation but many adopted a paternalistic attitude when they built model dwellings and imposed their own standards on the tenants charging low rents but paying low wages. As the Industrial Revolution took hold, industrialists who built factories in rural locations provided housing for workers clustered around the workplace. An early example of an industrial model village was New Lanark built by Robert Owen. Philanthropic coal owners provided decent accommodation for miners from the early nineteenth century. Earl Fitzwilliam, a paternalistic colliery owner provided houses near his coal pits in Elsecar near Barnsley that were "...of a class superior in size and arrangement, and in conveniences attached, to those of working classes." They had four rooms and a pantry, and outside a small garden and pig sty. Others were established by Edward Akroyd at Copley between 1849 and 1853 and Ackroyden 1861-63. Akroyd employed Giles Gilbert Scott. 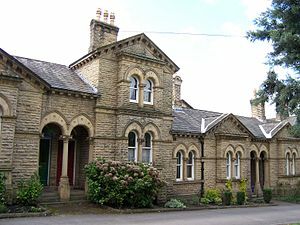 Titus Salt built a model village at Saltaire. 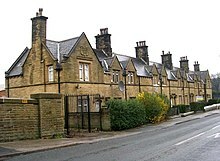 Henry Ripley, owner of Bowling Dyeworks, began construction of Ripley Ville in Bradford in 1866. Industrial communities were established at Price's Village by Price's Patent Candle Company and at Aintree by Hartley's who made jam in 1888. William Lever's Port Sunlight had a village green and its houses espoused an idealised rural vernacular style. Quaker industrialists, George Cadbury and Rowntrees built model villages by their factories. Cadbury built Bournville between 1898 and 1905 and a second phase from 1914 and New Earswick was built in 1902 for Rowntrees. As coal mining expanded villages were built to house coal miners. In Yorkshire, Grimethorpe, Goldthorpe, Woodlands and Fitzwilliam were built to house workers at the collieries. The architect who designed Woodlands and Creswell Model Villages, Percy B. Houfton was influential in the development of the garden city movement. In the 1920s Silver End model village in Essex was built for Francis Henry Crittall. Its houses were designed in an art deco-style with flat roofs and Crittall windows. The more recent development of Poundbury, a model village in rural Dorset has been supported by the Prince of Wales. Stadt des KdF-Wagens was built for the Volkswagen factory. Crespi d’Adda in the Lombardy region, is a well-preserved model workers' village, and World Heritage Site since 1995. It was built from scratch, starting in 1878, to provide housing and social services for the workers in a cotton textile factory on the banks of the river Adda. Nuevo Baztán outside Madrid dates from the mercantilist and entrepreneurial ambitions of an industrialist from the early-eighteenth century. ^ Pawson, Eric. "Wason, John Cathcart". Dictionary of New Zealand Biography. Ministry for Culture and Heritage. Retrieved 31 July 2010.